The figures emerged as Theresa May finally got tough with Europe in a barnstorming speech at No 10 warning she would never allow Brussels to make a mockery of the result of the 2016 Brexit referendum. The Prime Minister, who was humiliated by her European counterparts in Salzburg this week as they rejected her Chequers Brexit plan, hit back with some of the most uncompromising language since the referendum. At a hastily arranged press conference at No 10 she said: “It is something I will never agree to. It is something NO British Prime Minister should ever agree to. And it emerged her cliff-edge threat was not an idle one as it became clear huge numbers of civil servants have been working on a no-deal Brexit scenario for two years. What started as a handful of civil servants has become a vast army of 7,000 experts planning to mitigate all no-deal knock-on effects across every department. A well-placed Whitehall insider said: “The no-deal team has been gearing-up for every eventuality for the last two years. “The preparedness unit is huge and is working flat out to prepare for a no-deal scenario. “It is coordinating a massive effort right across Whitehall to make sure that we’ve explored every potential outcome in the event that there’s no deal and also how we mitigate that. “Brexit is hugely complex. So many times you identify and resolve a problem and find that it leads you on to another one. “The Technical Notices that are going out are not bits of work that have been pulled together at the last minute. 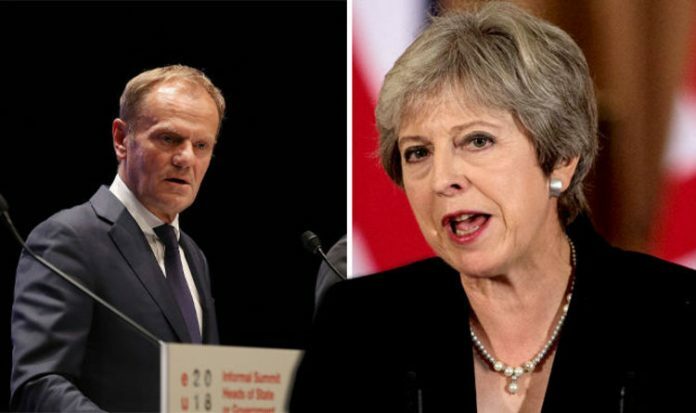 And a no-deal Brexit looked an increasingly realistic prospect today after Mrs May’s humiliation in Salzburg where her much-heralded Chequers plan to achieve a smooth Brexit was derided and dismissed by the other 27 European leaders. After what she hoped would be a conciliatory dinner turned out to be a highly public ambush the Prime Minister hit back with an impassioned and emotive speech at No 10 last night warning Brussels needed to show Britain more respect. In some of the toughest diplomatic rhetoric used since the EU referendum Mrs May attacked the EU for “making a mockery” of the UK’s Brexit vote. In a furious speech just weeks before the deadline for a possible agreement, she told her EU counterparts they were making a “fundamental mistake” if they thought she would let the UK be broken up over the Northern Ireland border issue. And she warned Britain would leave without a deal rather than agree to the bloc’s current demands – especially on the Irish border and access to the EU’s single market. Speaking inside Downing Street, she said: “I have always said that these negotiations would be tough, and they were always bound to be toughest in the final straight. In the defiant speech to cameras at 10 Downing Street, the Prime Minister said the EU needed to understand that she would not “overturn the result” of the EU referendum and would never sign off on a plan to “break up my country”.